Over the years I have accumulated a pile of USB flash drives. They range from a really old (but still used) 256 MB USB 2.0 drive to a new 64 GB USB 3.0 drive. 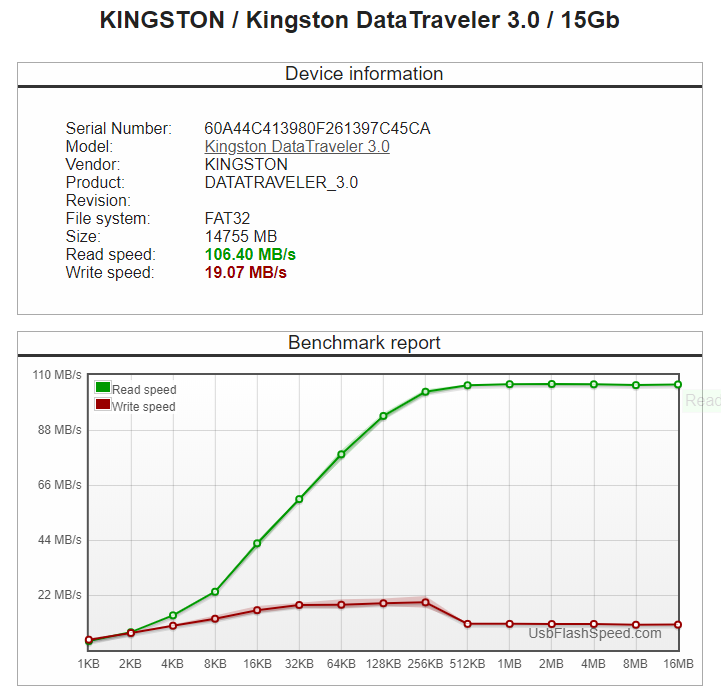 USB 2.0 flash drives can vary quite a bit in performance and I wanted to see how fast some of mine were so I tried out the freeware called USB Flash Benchmark. This is a small portable application that provides an easy way to test how fast a drive can read and write files of various sizes. It is mainly intended for flash drives. You can run a quick test and stop it or you can let it go through a battery of read-and-write tests using an assortment of file sizes ranging from 100 MB down to 1 KB. It does three write tests and three read tests with every file size and the whole panoply of tests can take a while. I just let it run in the background while I did other things. One minor annoyance is that there is no minimize button but you can just switch the focus to another window. An example of the interface is shown in the figure below. 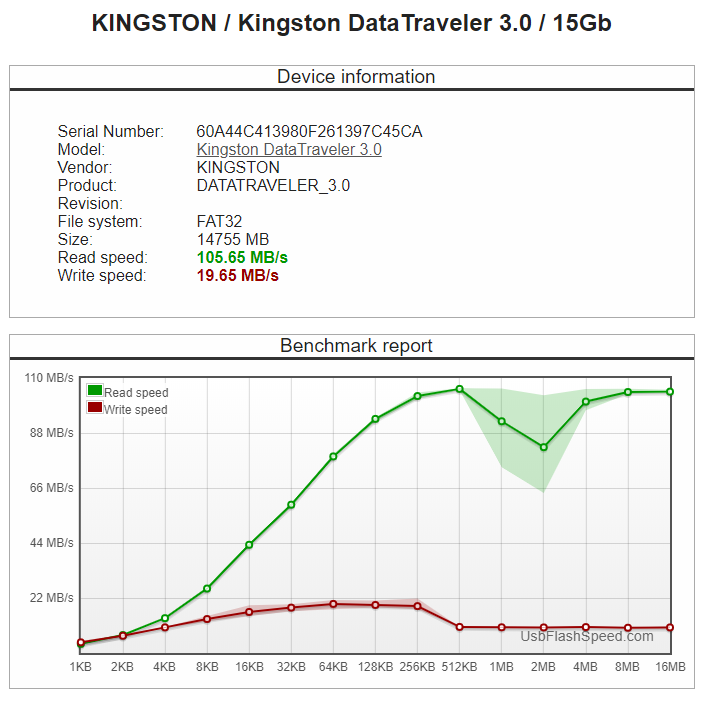 The results are given in the right pane and plotted out in a graph that shows speeds for different file sizes. An interesting thing I learned from the results was how much slower it is to process small files. The speed starts to fall rapidly somewhere around a file size of 64KB. As indicated in a previous tip, it really pays to zip them together before copying a lot of small files, even when taking into account the time to zip and unzip. The program can be downloaded at the developer’s site. It is a 35 KB zip file with a folder containing two small DLL files and the executable program file. The folder can be placed anywhere convenient and the program needs no installing. I ran it on Windows 7 64-bit with no problem. VirusTotal gives it a clean bill of health as did MalwareBytes and Microsoft Security Essentials on my PC. The developer’s site also has a database of statistics for many different makes and versions of flash drives. These have been uploaded by users of the utility and you can upload your own results by checking a box. You can also search the statistics to see if your particular drive has already been tested. Incidentally, my USB 3.0 drive tested out at around five to ten times as fast as my USB 2.0 drives, depending on which USB 2.0 drive is being compared. Individual USB 2.0 drives varied by a factor of around two in their speeds. 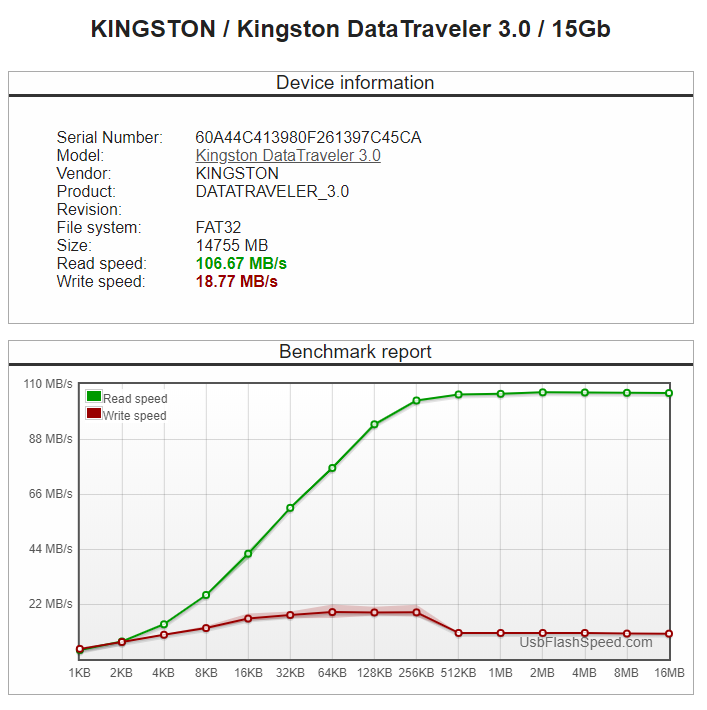 The USB 3.0 stats were similar to those for my main hard drive. Added Later: Reader Oxa reports that the .Net framework is required. I don't know which version. Offhand I don't know what the problem might be. The utility does read larger drives.